‘Fruit pretty large, turbinate, on an average about three inches and a half long, and two inches and three quarters wide at the broadest part, where it is obtusely angular, and a little contracted towards the setting on of the stalk. Eye small. Stalk an inch long, strong, straight, inserted in an oblique, angular cavity; in some specimens it is diagonally inserted under a broad, elongated lip. Skin delicate pale green, very slightly dotted with russet, which becomes a deeper yellow when ripe. Flesh whitish, firm, very juicy, perfectly melting, without any grittiness, and of a very extraordinary rich, sweet, high flavoured quality. In eating from October till February.’ [George Lindley – Orchard Guide p.393/1831]. 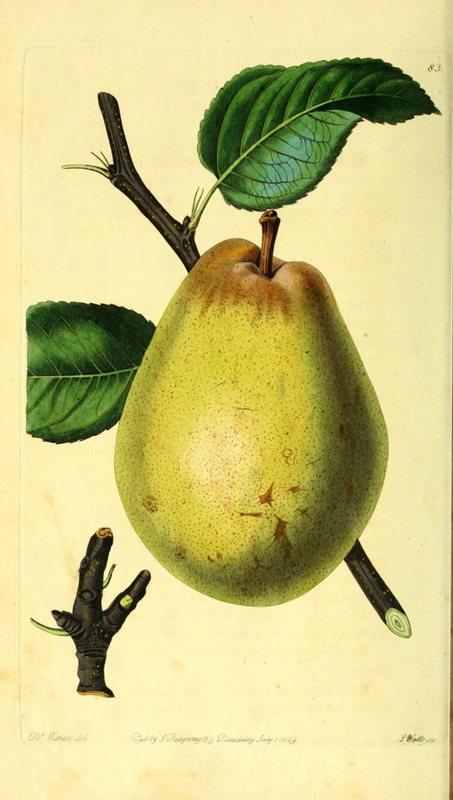 ‘This Pear is truly characterised in the Horticultural Transactions as deserving “to be placed at the head of all the Pears in cultivation.” We certainly do not know any variety which can, upon the whole, be said to equal it; for its flavour is not only excellent, and its flesh tender and juicy, but it is hardy, a great bearer, and will keep till March. It is usually cultivated as a dwarf, being grafted on Quince, and trained against an east or west wall; but it succeeds perfectly well as an open standard. It was introduced from Flanders about eight or nine years ago, along with a variety called the Gloux Morceaux, of rather inferior quality, but of great excellence, which is now often sold in the Nurseries for this. The Colmar Deschamps, said to be the same as this, is not quoted as a synonym, because it is doubtful whether it be not a distinct kind.’ [PM t.83/1829]. Raised by the Abbé Deschamps at the Hospice des Orphelines at Engheim. ‘This pear turns yellow shortly before it is fit for the table, and if tasted then has something of the flavour of the druggist’s shop, but when in addition to its yellow colour it softens, the coarse flavour becomes very rich and highly aromatic.’ [HP pl.LXX/1878]. Also figured in Le Jardin Fruitier du Muséum [JFM vol5/1863]. Listed only in the 1857 catalogue in an Addendum as ‘Beurré D’Aremberg’ [Pear no.38/1857]. In a copy of the 1857 catalogue the number ‘38’ is changed to ‘41’ and this aligns with the diary numbering. ‘41. Excellent with a slight refreshing acidity.’ [Diary B, MP A2951/1862]. Obtained from Veitch’s Nursery, probably the original Exeter premises.